A compact hand-held hot air welder for welding roofing membranes and similar applications. The BAK Rion welder is 230VAC 60 Hz, 1550 watts, and provides outstanding temperature control, ease of use using a step-less temperature from 20 to 650C and an air flow of 250L/minute. An adjustable temperature scale allows for an exact selection of temperature to fit your application. Full ONE-YEAR WARRANTY (except heater element). * Heat welding coated materials, films, tarp materials, foams and sheets. * A variety of tips are available for every application. * Standard roofing welder tips also fit. * Frequency: 50 - 60 Hz. * Temp: Step-less adjustable temperature from 20 - 650°C (70 to 1200F). 20 MM WIDE NOZZLE X 2 MM SLOT WITH 60 DEGREE ANGLE HOT AIR WELDING NOZZLE, STAINLESS STEEL, (type 107.125). PRICE/EACH. 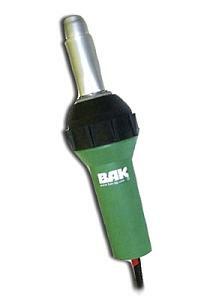 BAK RION REPLACEMENT CARBON BRUSH SET (2). FITS PRE-2010 MODEL BAK RION MOTORS (BOTH 120V/230V MODELS). PRICE SET. REPLACEMENT AIR FILTER FOR BAK RION HOT-AIR WELDER (2 inch long filter, fits newer 2010+ tools). PRICE/EACH. REPLACEMENT HEATER TUBE FOR BAK RION HOT-AIR WELDER. PRICE/EACH. 230V 1550W Replacement Heating Element for Hot Air Welders. Fits Triac-S and Bak Rion welsers (element type #33, 100.689). Price/Each.